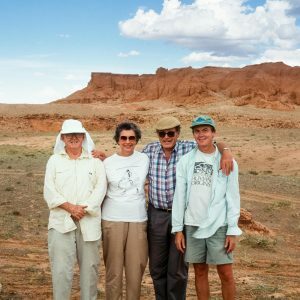 On July 4, 2017, the Raymond M. Alf Museum of Paleontology lost Hugh Rose, one of its most cherished leaders and supporters. At age 90, Hugh passed away from natural causes, surrounded by his family at their Tucson home. While building a career as a successful business executive, Hugh and his wife Mary amassed a spectacular collection of fossils and began teaching paleontology out of their Illinois home. In the 1970s, Hugh was asked to evaluate the value of the Alf Museum’s collections, and he ended up becoming a founding member of the board of trustees in 1979, later enrolling his son Matthew ’82 in Webb School of California. Early on, Hugh recognized the great educational and research potential of the Museum. He and Mary donated most of their personal collection of fossils in 1985 and also established the Hugh & Mary Rose Endowed Fund to provide a permanent source of revenue for the Museum’s operations. If one were to ask who was the creative force behind the Peccary Society Dinner, those memorable peccary glasses, and the peccary trips to Mongolia, that would be Hugh Rose. As we honor the legacy that Hugh Rose left at the Alf Museum, we are filled with gratitude and admiration for his passion, generosity, and dedication. We extend our condolences to Hugh’s wife, Mary, to his children Nancy, Greg, Matt ’82 and Mary, and his grandchildren.